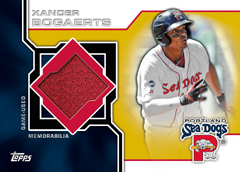 2013 Topps Pro Debut Baseball gives the year's flagship MLB set a minor league twist. The official national-level set of MiLB, it captures the stars of tomorrow on their way up through the ranks. The 2013 Topps Pro Debut Baseball base set has 220 cards. All have a Gold parallel numbered to 50. A total of 15 cards also have a variation version. Hobby boxes promise a pair of autographs, a manufactured patch card and one additional premium insert. Using a design that's a slightly altered version of the base card, autographs have signatures done on stickers. Parallels include Gold (#/50), Red (1/1) and Printing Plates. Falling at least one per box, 2013 Topps Pro Debut Baseball has two manufactured patch sets. Hat Logo Patch Cards recreate some of the most memorable logos in all of sports. Parallels include Gold (#/5), Red (1/1) and Printing Plates. Taking a page from Upper Deck Football, Minor League Mascot Patch Cards spotlight some of the game's greatest crowd pleasers. Parallels come in the form of Gold (#/50) and Red (1/1). Boxes that have only one patch card also have a Minor League Material game-used relic. Gold parallels are numbered to 50. Numbered to 5, Jumbo Patch cards have an over-sized swatch. 2013 Topps Pro Debut Baseball has randomly inserted redemptions for full pieces of game-used memorabilia. The set also pays tribute to Bull Durham, one of the most popular baseball movies of all-time with one-of-one Cut Signature Autographs from the film's actors and redemptions for buyback packs of movie cards. Featuring 220 cards. Shop for base sets on eBay. Good: Top minor league prospects. Two Autographs and two relics per box at a reasonable price. Bad: Photo variation cards difficult to identify. Not a fan of the Mascot Patch cards. 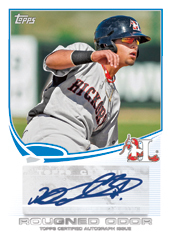 The Bottom Line: 2013 Topps Pro Debut consists of the top prospects from all levels of the minor leagues. Many of these cards contain mid-season call-ups like Yasiel Puig. With a pair of autographs, a game-used memorabilia card and a manufactured patch card per box, prices are reasonable. The card design is similar to the regular 2013 Topps Baseball. If you like that look, then you will probably like these cards too. It is sort of like the little brother imitating the big brother. The basic white border shows a traditional format. The cards have a coordinating color that varies according to the team. There is a slight gloss to the cards with the logo in the bottom right. The back consists of the team affiliation which is helpful for some of the lesser known minor league teams. Since most of the players have limited experience and thus limited amount of statistics, each card tells about each player focusing on when they were drafted and if they were involved in a trade. 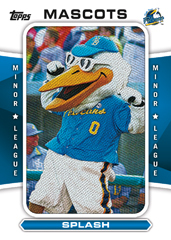 The Hat Logo and Mascot patch cards have a large canvas. They are very thick which, is a plus to keep them in mint condition. The autographs are, unfortunately, stickers. The checklist here is decent but I was disappointed because I received two of the same autographs. The relic cards are nice with designs that often color coordinate and match the team uniforms. The idea of getting a manufactured "hit" of a mascot is something that seems a little strange to me. Personally, I would rather have a second hat logo, jersey, or bat card. Compared to similar products, the value seems about right. It comes with a smaller price tag than most prospect-themed Bowman products but you get more in the way of autographs and relics. Compared to unlicensed prospect products, the price tag is fair. You're not going to get rich off of these cards, but you shouldn't feel like you wasted your money either. This box was a lot of fun to open and get cards of players who were recently top draft picks or are on the verge of making their MLB debuts. It adds a layering to following someone's career as it takes off or flops in the years ahead. 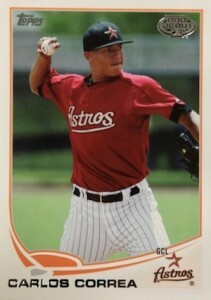 Always enjoy the minor league cards with Topps format. Is their a retail version. On two sites people were buying boxes left and right and when you went about 3/4 of the way down it says retail boxes. Dave Karpinski � It looks like there will be a retail version. Haven’t looked to see what the differences are. Dave Karpinski � That’s very unfortunate. Were the retail boxes advertised as such? It’s always a risky venture when you don’t know exactly what you’re getting. I don’t consider this the better sets Topps produced for this series. Purchased two Hobby boxes and was promised 2 autographs cards per box and only received one in each. Pulled a redemption card for Shawon Dunston Jr (PDA-SD) and when I went to redeem it at redeem.topps.com noticed there was no sticker on the back of the card with the code to redeem. Don’t care for the Mascot patch cards. Those would be suited for the Opening Day series. On the plus side, I did pull a printing plate of Alex Meyer, and fewer chase cards or inserts allows you to complete the set easier. Way too high of a turnover rate, IMO. But still love the idea of logo patches. And it should be in this set, not Opening Day. This set is focused on MiLB. Opening Day is focused on spring training rosters in the MLB. 2013 Topps Pro Debut Baseball Hobby Box - Factory Sealed!